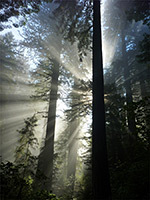 The busiest trails in Prairie Creek Redwoods State Park are towards the south, beginning at Elk Prairie or from several trailheads along the scenic drive (Newton B Drury Scenic Parkway), since this region has the most extensive old redwoods; paths further north along the road are less popular because the largest trees are restricted to a relatively narrow band, either side of Prairie Creek. The Ossagon Trail is one such little-used route, starting near the upper end of the creek, climbing gently past many huge trees to a minor ridge then descending steeply through secondary forest all the way to a wide beach, where the Coast Trail continues southwards. Although giant redwoods are only found along a short part of the 1.8 mile trail, the hike is one of the best in the park, especially if extended by walking north along the beach for a mile or so, since it passes a great variety of scenery. 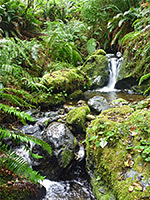 The forest changes from closely-spaced, old growth redwoods to an airy, fern-carpeted mix of other trees on the far side of the ridge, then more diverse and overgrown woodland lower down, and is accompanied by a small stream that forms some pretty pools and cascades. Coastal environments include grassland, marshes, lagoon-like pools, sand dunes, isolated rocks and extensive beaches, all of which support a great range of wildflowers. 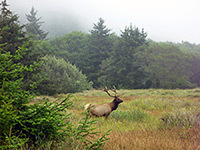 Elk are often in residence along the coast, grazing the bluffs and grassy areas. Unusually for the park, the trail is also open to bikes, part of a 7.5 mile loop (also involving the Coast Trail, Davison Road and the Parkway), but it does not appear to receive much use, either hiking or cycling. 33 views along the Ossagon Trail - gallery, slideshow. The Ossagon Trail begins at the northernmost trailhead on the west side of the parkway, at a signed pull-out with space for about ten vehicles, opposite the slightly smaller parking area for the Hope Creek Trail, another little traveled-route. Both trailheads have a map and information poster. Another sign, on the east side of the road, identifies the trees here as part of the National Council of Garden Clubs Grove. 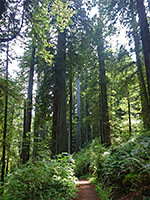 The broad, well established trail immediately crosses a small stream - the upper end of Prairie Creek, and rises up a gentle gradient, past plenty of huge redwoods, growing close together. 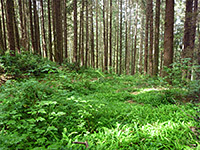 The vegetation is lush and dense, and this part of the forest is especially beautiful when fog is clearing, the trees partially illuminated by transient sunlight. Several species of flowering plants grow beside the path, including redwood sorrel, silverweed, self heal and monkey flower. The trail moves along a flat ridgetop for a while, the land sloping down slightly to the north into a little ravine, and much more steeply to the south, at the upper end of the valley of Butler Creek. 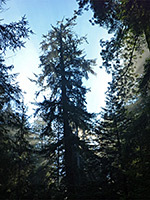 A highpoint of 750 feet marks the edge of the old growth redwoods; after here the path starts to descend towards the beach, and the trees become noticeably smaller, the understory vegetation less; mostly small, low growing ferns. The trail is now wider, following an old logging track, the east section of which (linking with the parkway), has been removed. The Pacific Ocean becomes audible, less than one mile away. The path curves downhill, quite steeply for a while then less so, entering the bushy valley of Ossagon Creek, where the distant sound of waves is replaced by the more gentle trickling of the stream. 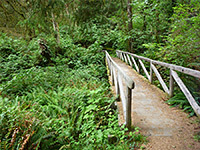 The creek is crossed on a sturdy, ancient-looking wooden bridge, then followed on the far side, staying close to the stream, though this is hidden by dense vegetation. The route bends away from the valley briefly then returns, descending steeply again as the edge of the forest approaches. A sign announces that the land ahead is within the tsunami hazard zone, a consequence of potential seismic activity in this region. The path crosses the creek a second time, just below a photogenic section with pools, cascades and much dark green vegetation, then exits the forest, crossing open grassland, a likely location to see elk. 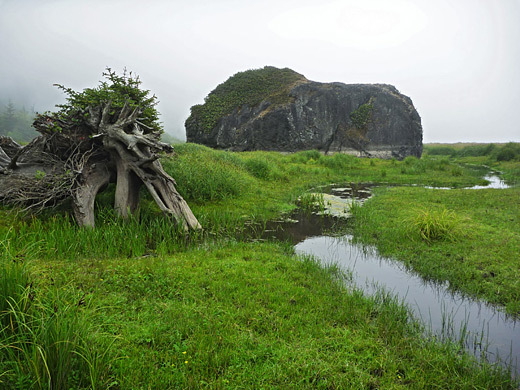 A junction marks the start of the Coast Trail southwards, while the last section of the Ossagon Trail is due west, past a few patches of trees, over a minor drainage (Butler Creek) lined with yellow monkey flowers, and finally out to a wide beach of grey sand. The high water mark is usually about 800 feet away, and the ocean may still be out-of-sight, obscured by fog. On clear days, the views south extend a long way, along uniform sand and dunes lacking any particular features, but to the north the land looks more interesting, because of various rocky outcrops. Many flowers grow along the beach margins, from yellow sand verbena in the sandiest locations closest to the ocean, purple pennyroyal slightly further inland, and then a much bigger variety in the grassier regions towards the edge of the forest, and in the riparian areas along the lower end of Ossagon Creek; the stream runs north for half a mile at the edge of the beach, forming marshes and still pools, bordered by long or short grass. The reflections on the calm water, the variety of vegetation, the dark, jagged rocks and a few fallen trunks with new plants growing on top, all combine to make this area very pretty. The closest large rocks are just a few hundred feet beyond the end of the trail - one is right beside the stream, rising above a deepish pool, another close by towards the ocean. 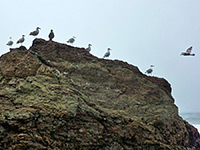 The next group, known informally as the Ossagon Rocks, are more angular, and in wetter times are also close to a shallow pool. 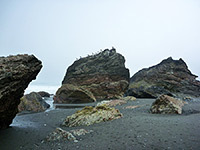 Further north, the beach narrows gradually, and after another half mile the sand gives way to boulders, and more big, jagged rocks, slightly more colorful than the dark grey outcrops the south - dull pink, brown and light grey. The rocks are jagged, eroded and covered with mussels below the high water mark. The adjacent hillside is close, and steep, mostly grassy with some exposed sandstone. 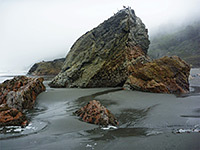 The beach stays quite narrow to the north and is bordered by more rocks and a lagoon and after half a mile, around the end of the Carruthers Cove Trail.